Eye Level at Exposure Gallery showcases photographs taken by children 10 and under. From left: "Cat" by Ada Novos, "Halloween" by Stuart Campbell, and "Pug" by Charlotte Watkins. So, what really fascinates your kids? How exactly do they see the world? For some insight into the world inhabited by children, visit Eye Level, a new exhibition at Exposure Gallery of photographs taken by kids aged 10 and under. Judging by the prints on the wall, food holds a great deal of interest. So do pets and shadows and bright colours. The perspectives are often unique, uncluttered by the aesthetic biases of adults who feel compelled to reproduce the style and content of professional photographers. Kids simply shoot what interests them. A particular photograph ignited adult minds to create the show. It was, according to Sayani, the photo of a door with a sunlit-cast shadow taken spontaneously by Rania Robertson, Sayani’s daughter. Rania was just three years old at the time. Her very arty-looking photograph was the kind of work many photo-artists strive to create. Rania’s photograph was shown to her neighbours, writer Babara Sibbald and Kinmond. It was a eureka moment. The seed of Eye Level was planted. An open call was made to parents to submit photos. Sayani and Kinmond then selected the ones for the exhibition. Stuart Campbell is undoubtedly the star of the show, with eight photos that were taken when he was 10 (he’s now 12). My personal favourite in the show is Stuart’s picture of Halloween loot spread out like the jewels in Ali Baba’s cave. Another one of a plate of poutine is also well-constructed. Tied for second, in my opinion, are the pet photos by Ada Novos and Charlotte Watkins. Ada’s photo, called “Cat,” shows a feline reluctantly accustomed to being held just a little too tightly by juvenile hands. But for some unknown reason, the cat still remains willing to put up with the discomfort. The look in the black cat’s eyes tells a hundred stories. 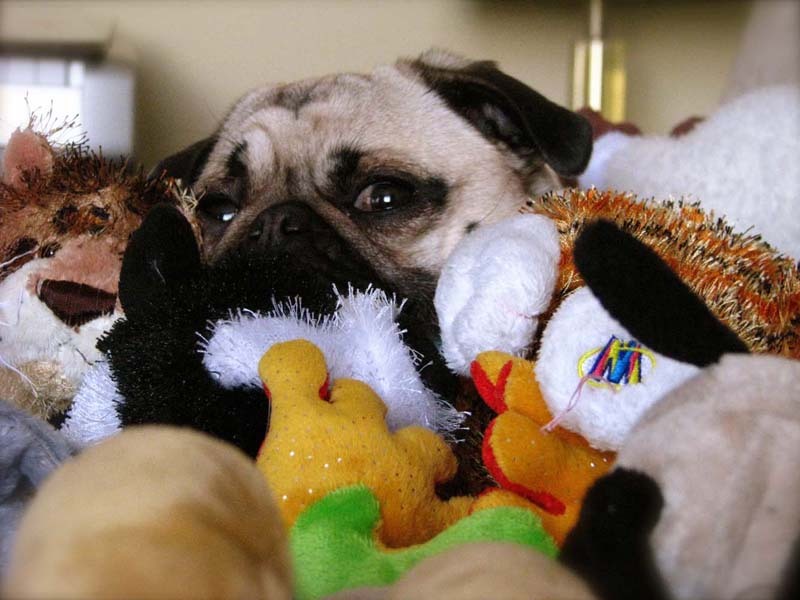 Likewise Charlotte’s photo called “Pug,” showing not much more than the eyes of a small dog peering through a pile of stuffed toys. Pug seems to be pleading: “But I’m not a toy.” What a heartbreaker! The photographs at Exposure are placed on the wall at a height comfortable for children. Prints of the photographs are all for sale for modest prices of $20-$30. Go buy one. Encourage a child’s creativity. There are tentative plans to make this an annual event at Exposure. The gallery is located on the second floor of the Thyme & Again food emporium. The exhibition continues until Oct. 30.